TONIGHT -- WE SPOTLIGHT A FINALIST FOR TEACHER OF THE YEAR WHO'S PROVING TO BE A DOGGONE GOOD TEACHER. JACKIE REED OF ANDRADA POLYTECHNIC IN VAIL -- INSPIRES HER STUDENTS WITH HER OWN PASSION FOR TAKING CARE OF ANIMALS. TUCSON, Ariz. — Arizona Athletics and KGUN 9 are partnering with the University of Arizona Online to recognize some of Southern Arizona's top teachers. Teacher of the Year nominee Jackie Reed of Andrada Polytechnic in Vail, inspires her students with her passion and compassion for taking care of pets. 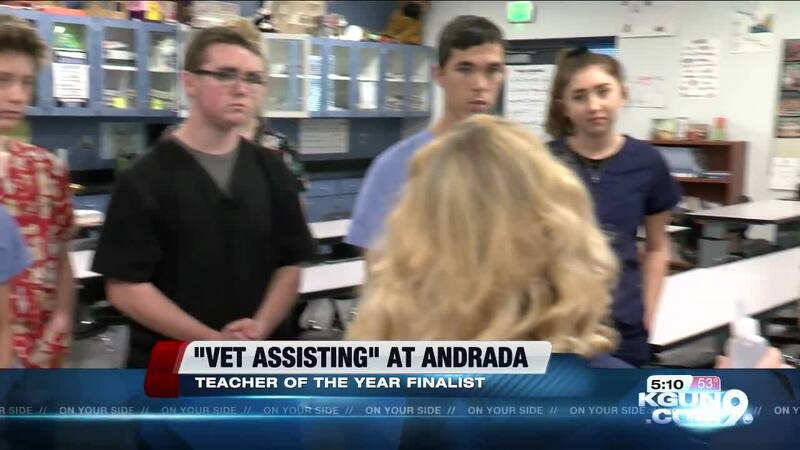 Reed is in her seventh year at Andrada teaching Vet Assisting. The class gives Juniors and Seniors a chance to earn Pima Community College credit towards an eventual degree in Veterinary Technology. Reed finds relationships are key to the success of her students. "They want to make me proud," said Reed. "I push them. There's kind of not a choice. You're going to do it. Because that's what has to be done." A large number of her students go on to careers in veterinary medicine. "Yes I love it when they go out into vet medicine. But I want them to just be successful adults." Reed is one of nine finalists. For the first time, each finalist will receive $500. Arizona Online has also increased the winner’s prize money from $1,000 to now $2,500. For over 20 years, Arizona Athletics has showcased excellence in education by recognizing outstanding high school teachers in Southern Arizona. The University of Arizona Online has joined this initiative and is the proud sponsor.